Summer is here! I’ve officially crossed the pond from freezing cold northern Europe to tropical southern Canada! I am pretty happy to feel the sun shining and the heat in full force. Finally. As I was looking at my calendar the other day, I realized that my summer holiday doesn’t really include much “holiday”. 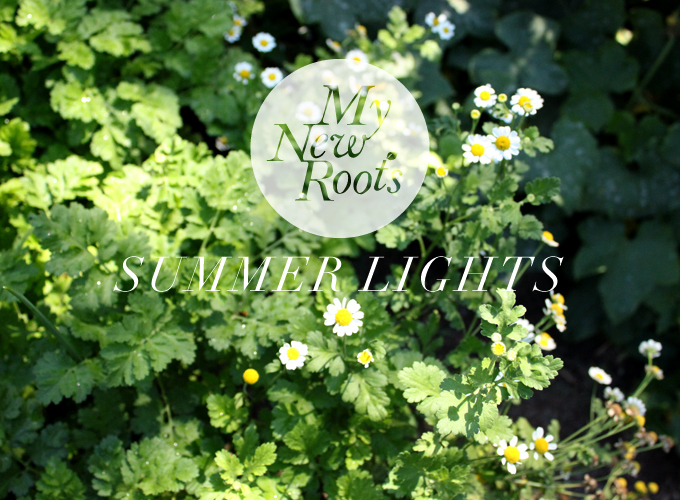 So in the name of finding a balance I have created My New Roots Summer Lights: a way for me to share fantastic, healthy recipes, without the lengthy article. I am excited about this new, lighter take, and hopefully I’ll be able to share even more simple summer meals with you. This feature will run for the next couple months, and the regular columns will resume in the fall. I hope this makes your summer brighter too – I know you’d rather be sitting on the dock than behind your computer anyway. I’m kicking Summer Lights off with my new favorite smoothie that combines fruits, veggies, and superfoods, all while tasting like a sinful summer cocktail – The Mojito Smoothie! Zesty lime, refreshing mint, and sweetness from fruit instead of sugar makes this drink a tall glass of delish. The Mojito Smoothie of course makes an amazing breakfast, but I prefer it for lunch or even a light dinner. If you like your green smoothies fruit-free, omit the banana and dates and use stevia powder instead. You can also add spinach, kale, chard or other dark leafy green of your choice. 1. Place all ingredients in a blender. Blend on high until smooth. Taste and adjust flavours to your liking. I hope you all are enjoying a fabulous summer so far. I am looking forward to lots of deliciousness this season and sharing it all with you. im laughing about your *whatever you can handle* right now, soooooy understanding!! what a great idea ! I am an absolute fan of mojito ! I will give a try with your smoothie ! Perfect! I’ve got mint going totally bonkers on my balcony right now and I’m searching for new ways to use it up. I’ve never tried avocado in a smoothie before, looking forward to trying this! Sounds wonderful! Can’t wait to try it. First time here and love this recipe. I can’t wait to try it! Happy summer and happy holiday! Enjoy the tropics of Ontario and all of its stunning produce! I have a feeling that this mojito smoothie and I will be spending a lot of time together this summer. I am looking forward to more Summer Lights! I can’t wait to try this-sounds like the perfect summer lunch! I am drinking goji berry lemonade as I read your latest post! Love the Summer Lights idea- I had the same thought last week, thanks for the inspiration! Thanks for sharing. I can’t wait to try this! Love your recipes & photos even without a lot of text. Keep up the great work! Your pictures are just so beautiful! Really, I just love them. THIS. is nothing short of fabuLOUS. Sounds delicious! 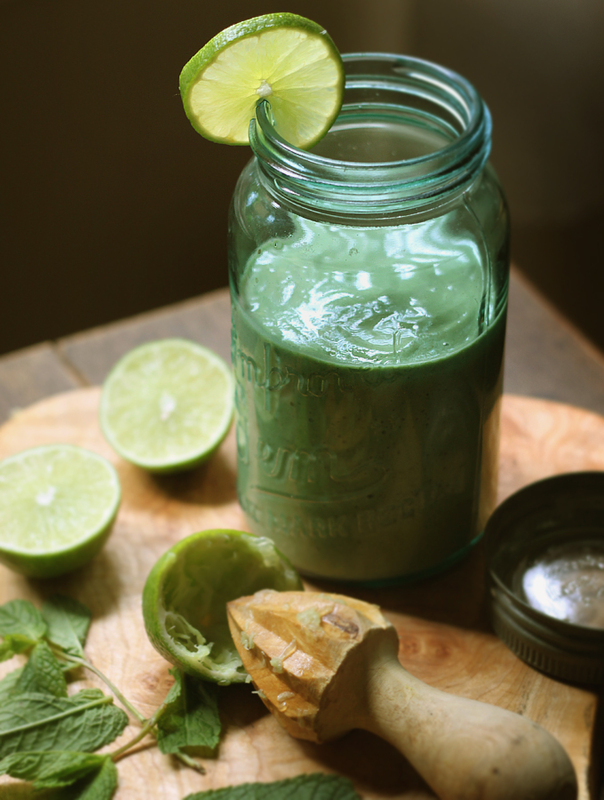 I make a similar green smoothie at home with mint and lime and I love that flavour combination. It’s perfect for summer. Hi Jacqui – buy stevia that is powdered and STILL GREEN. I used to grow it and I promise it’s a completely natural product until they bleach it and make it into ‘sugar’. The green powder is just dried and crushed leaves. Hooray! Hello Melinda – you can sub-in any nut or seed you like, just make sure to soak first to soften them up. Or use chia! Great idea for the new posts, and this Mojito Smoothie sounds wonderful! I don’t think I can get hemp seeds here – although I’m still looking – is there something I can substitute for them? I love Green Smoothies, but this one tops everything. Will try this on the weekend. The “light” articles are a great idea. Enjoy Canada and have a wonderful summer holiday! how delicious ! i love mojitos — this sounds fabulous! I do love a mojito, and this looks so refreshing! This sounds great Sarah! I love starting my day off with a fresh glass of green smoothie. I’m really interested in hearing you take on stevia to though? I know that it’s plant derived, but I still sometimes get freaked out by things that come in packages, especially when they remind me of things like Splenda! Anyways, just wanted to hear your side on this alternative sugar and if it’s worth using over other natural fruit sugars and honey. I’ll be making this for sure! Thanks, Sarah. Making this lovely tomorrow morning! Thanks! Adore smoothies and always up to a new one!